These scholarships are listed by month due. Expect deadlines are 1st of the month – don’t miss deadlines. ZipRecruiter is offering a $3,000 scholarship for seniors, available each semester! Monthly Scholarships from Nitro College Scholarships! StepUp to College Costs Scholarship program for 8th-11th graders – This scholarship program is designed to help students prepare for college costs before their senior year. This program has two separate scholarship contests: one contest for 8th/9th graders, and one contest for 10th/11th graders. The essay topics/requirements are different for the two pools of applicants (see below). The deadline for all applications is 11:59 p.m. on April 15, 2019. 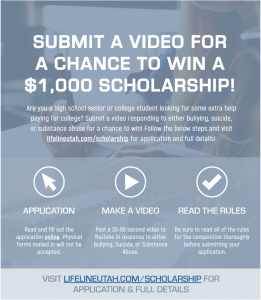 All winners will be informed by May 1, 2019.
https://lifelineutah.com/scholarship/ Deadline: April 15, 2019. Jiffy Lube – Teen Driver Scholarship Program – Teens currently in Drivers Ed can submit a 500 word essay on “What Drives You?”. Apply online at https://www.yourturn2apply.com/utah.htm by April 18, 2019. Essays only, no transcripts please. We are basing our winners on Essay only, not grades or GPA. All essays should be emailed to our firm at Nadean@pearsonbutler.com, with “Scholarship Essay” in the subject line. The award is a $500.00 Cash Stipend, a check will be issued once proof of higher education enrollment is provided; college, university, trade school. Can be used for books, tuition, housing, etc., this is completely up to the student to decide. The firm’s partners will vote for the most meaningful essay. 2019 Design a Better Future Scholarship – Students will work on a project to help improve their communities. Because we have high expectations for our awardees’ work we’re offering scholarship awards to match: five $10,000 tuition awards! We select applications based on their completion, seriousness, and viability. We will also help fund the top project up to $5,000. 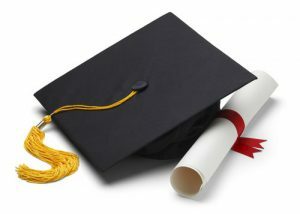 Here is the link to all of the scholarship information: http://www.honorsgradu.com/scholarship-faqs/. You can also see the projects of last year’s recipients to learn more about this opportunity. Deadline: OPTIONAL: Submit your working strategy plan and any other work to receive feedback by March 23, 2019. Submit your final project application by April 28, 2019. BYU Management Society Scholarship – THIS IS NOT A BYU SCHOLARSHIP – Seniors who demonstrate financial need, academic excellence, leadership and meaningful community and/or religious service. Apply here: https://form.jotform.com/BYUMS/2019-Scholarship-Application. Deadline: April 28, 2019. Cirkled In $1,000 Scholarship – open to 8th-12th grade students and are free to apply for. It’s a simple and easy process – students answer a short prompt question, then tell us about their activities and passions. There’s no minimum GPA and no long essay to write. Students can use for any educational need, from tuition to books and supplies, even transportation if needed. $1500 Scholarship for senior who has overcome obstacles and challenges that could have prevented him/her from graduating from high school. Email a one-page essay on “What have you done to overcome challenges and what lessons you learned that will help you in your future?” and the following information to Alicia.summers@jordandistrict.org. Utah Energy Workforce Scholarship – The Governor’s Office of Energy Development is proud to partner with Chevron to advance Utah’s energy workforce by providing scholarships to high school seniors who intend to pursue a STEM (Science Technology Engineering or Math) related course of study at a public or private institution of high learning in Utah. Submit a five-minute film on energy and write an essay about your STEM goals to kevinbrooks@utah.gov. 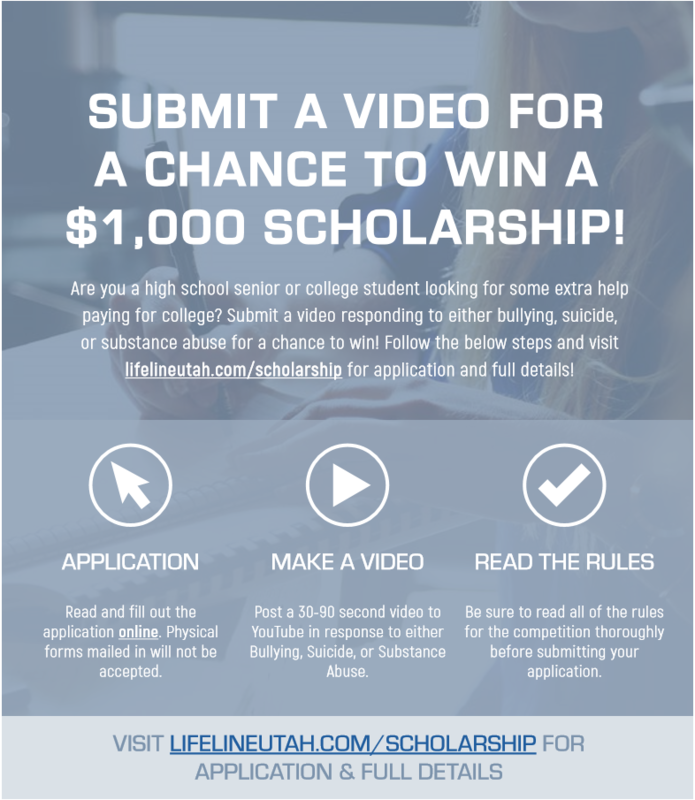 More information at https://utahenergyed.org/scholarships/. Deadline May 1, 2019. PONY Baseball and Softball Alumni Scholarship – players must play on a PONY (Protect Our Nation’s Youth) team for at least two years prior to application and be a senior in high school. Applications must be submitted by May 1, 2019. PONY Baseball and Softball offers four (4) U.S. students every year the opportunity to win its Alumni Scholarships for $2,000 apiece. To learn more about the scholarship, click here: http://www.pony.org/Default.aspx?tabid=1025997. The Utah Alpha chapter of Sigma Phi Epsilon $500 Scholarship – incoming freshmen men at Utah State for the 2019-20 academic year. SigEp is an undergraduate fraternity that will award over $300,000 at 160 campuses across the country during the 2019-20 academic year. Our mission is Building Balanced Men. The Balanced Man Scholarship rewards men who exemplify the qualities of a Sound Mind and a Sound Body, as we believe they are two ideals essential to leading a balanced life. To qualify for the Balanced Man Scholarship, incoming students must submit an online application by the early application deadline of June 1st, 2019 and enroll full time at the Utah State for the fall 2019 term. Applicants have no obligation to join or affiliate with SigEp to be eligible for the scholarship. Should you have any questions concerning the Balanced Man Scholarship or the transition to college, please contact jonahhansen14@gmail.com. Perform & Musical Theatre Tracks: 9 AM-12 PM | Technical Track: 10:30 AM-1:30 PMJoin ambitious, creative theatre students from across Utah for two weeks of exciting and relevant theatre creation. Participants will take master classes in one of three workshop tracks, culminating in a fully staged public performance at The Grand Theatre.Performance Track: Students will take master classes in Acting, Shakespeare, Devised Theatre, Stage Combat, Directing, Playwriting, Auditioning, and Voice and Movement for the Actor. These skills will be applied directly to the creation of an original theatrical performance on the stage of The Grand Theatre.Technical Track: Participants interested in technical theatre will study Lighting Design, Sound Design and Engineering, Costume Design, Set Design, Scenic Painting, and Stage Management. Students will apply these skills to designing and running an original theatrical performance on the stage of The Grand Theatre.Musical Theatre Track: Participants interested in musical theatre will take master classes in Broadway style Voice, Dance, and Acting as they develop a musical theatre showcase of solos, duets, and group numbers to perform on the stage of The Grand Theatre. The Chairish “Design Your Future” Scholarship – $2,500 Chairish is committed to helping college students achieve their dreams. If you are overcoming obstacles to earn a college degree, we want to hear from you! Students from all majors are encouraged to apply, but preference will be given to applicants pursuing design and engineering- related fields. Students must meet the following eligibility requirements to apply: minimum 2.0 GPA, open to graduating high school seniors, college undergraduates, and graduate students, Must be enrolled or planning to enroll at an accredited two-year, four-year, or technical/vocational college or university in the United States, this scholarship is open to students from all underrepresented backgrounds. Examples of ideal applicants include, but are not limited to, students from racial minorities typically underrepresented in higher education, first generation college students, women pursuing a degree in a STEM or typically male-dominated industries, students with disabilities, and or similar situations. Dixie State University Red Rock Ridge Housing Scholarship– Deadline: July 1, 2019. See application and information packet by clicking here. Seniors who are interested in attending Dixie should look into this opportunity for housing. The SeniorHomes.com Scholarship – is intended for students who are passionate about helping seniors live healthy lives and are pursuing careers in senior care. The award can be used towards tuition and/or books. Applicant Eligibility: Applicants must be actively enrolled in or accepted to attend a U.S. college or university and pursuing a career in senior care. Application Requirements: Applicants must submit either a 500-word essay or 2-3 minute video addressing a topic related to elder care. Deadline: July 31, 2019. Helpjuice Scholarship worth $1400 per student, for two students/freshmen. We established the Helpjuice Scholarship to help propel the next generation of young technology entrepreneurs, developers, and marketers. Both current students and rising freshmen are eligible to apply and the deadline is August 20th, 2019. For more information about our scholarship, you may visit https://helpjuice.com/scholarship. Heer Law Entrepreneurship Scholarship worth $2000 CAD. We created this scholarship with the intention to help young entrepreneurs & leaders to learn how to protect their business. Deadline: December 31, 2019. For more information about our scholarship, you may visit this page.